The ultra-lightweight Factory Series Float® 3 Evol RC2 offers infinite adjustability, dual stage air springs, a dual-speed compression adjuster, a wide-range rebound adjuster and velocity sensitive damping controls that give you the best possible front-end traction and steering performance in every conceivable terrain condition. 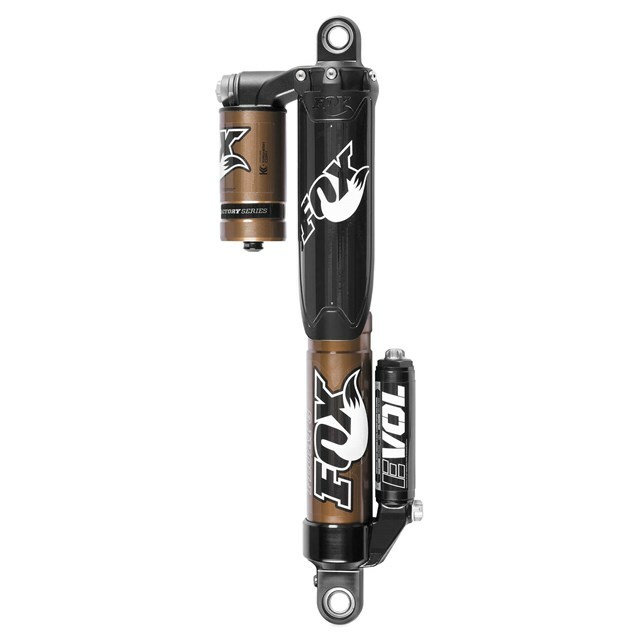 Once again, Fox updated and refined the performance and appearance, reduced friction and heat through the use of Kashima Coat, revised damping pistons and performance altered internal features to provide a more robust, better performing and smoother running, highly adjustable overall package. Forget about heavy springs and running out of adjuster range, the Float 3 Evol RC2 offers a huge range of adjustments and allows you to set it up for anything from race to trail or dunes. External rebound adjustment allows you to tune the rate the shock returns after compression in order to optimize control in all conditions. New high-flow, high- and low-speed compression adjuster offers an increased adjuster range. Chrome silicon negative spring offers improved stutter bump compliance. Fine-tune roll and turning capabilities with the infinitely adjustable Evol air chamber; regulate spring rate in the final portion of the stroke and control bottoming-out. Infinitely adjustable main air chamber gives a progressive spring rate and provides significant weight savings. Race-proven, velocity-sensitive damping control technology that is custom-tuned for its intended application with different piston flow designs and variable valving specifications. Shed up to 6 lbs. off your ATV when replacing coil spring shocks. Precision manufactured damping pistons for maximized damping consistency and flow characteristics. Aerospace-grade, PTFE-lined spherical bearings maximize durability. Anodized Internal Floating Piston (IFP) and bearing housing prevent oil contamination and boost seal durability and lifespan. Genuine Kashima Coat’s distinctive gold color backed by its buttery-smooth, high-performance attributes: exceptionally smooth feel and extreme durability. Samurai Sealing System specifically designed from a special low-temperature, highly durable material that scrapes away dirt, mud and debris while keeping the seals lubricated for minimal friction.